This is a great treat for parties, especially as an aperitif. If you don’t trust your layering skills under pressure, you can pour these in advance, put them on a serving tray and leave them in the fridge to stay nice and chilled. When the times comes, just pull the serving tray out carefully and carry it in to deliver the drinks to your guests. Pour grenadine to about 1/3 of your shot glass. 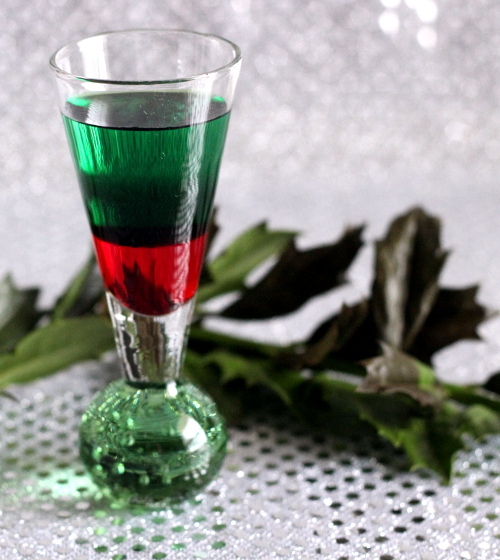 Carefully layer the creme de menthe, then the peppermint schnapps.